The title of this nectar-guidebook to Radha-kunda is based on this wonderful sloka from Sri Krsna Dasa Kaviraja Gosvami, The name, form, qualities, pastimes, friends, and home of Srimati Radhika are full of unlimited glories and sweetness. 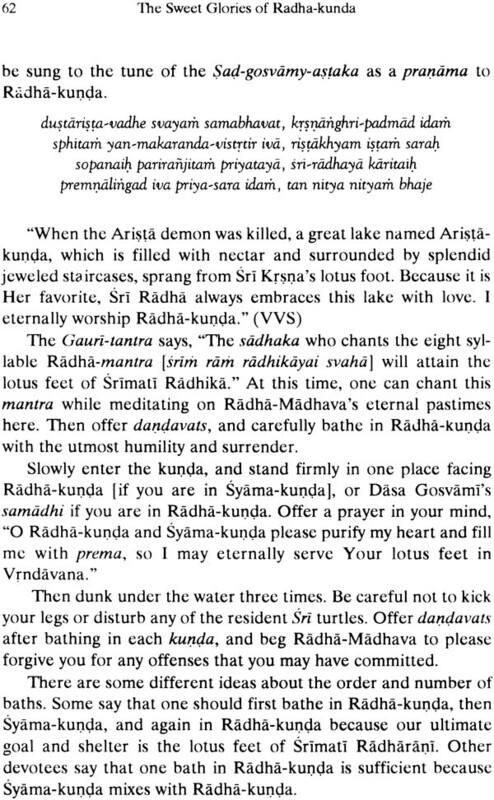 As everything connected with Sri Radha is full of the sweetest mellows, similarly, Her divine lake, Sri Radha-kunda is overflowing with the sweetest transcendental glories. 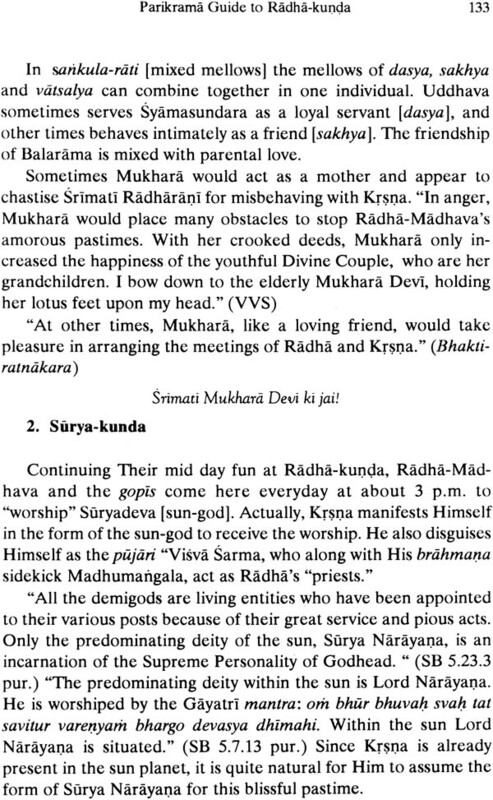 Although this topmost place of Radha-Madhava's intimate pastimes almost disappeared from the world, by the mercy of Sri Caitanya Mahaprabhu, Radha- kunda reappeared to bless the most fallen with the rarest gift of Krsna prema. For the last five-hundred years, this secret storehouse of mercy remained hidden within the sacred writings of the Six Gosvamis. Other than a handful of Gaudiya Vaisnavas in India, no one had any knowledge or appreciation of the glories of Sri Radha-kunda. Lord Caitanya, who came to Vrndavana and personally revealed the location of Radha-kunda, wanted people in every town and village to sing the glories of Radha and Krsna. By offenselessly chanting the Lord's glories one may have a chance to fulfil Lord Caitanya's inner desire. As Sri Caitanya Mahaprabhu wanted everyone to chant the holy names, He also wanted everyone to bathe in Sri Radha-kunda. Bathing in Radha-kunda means to live eternally in Vraja-dhama blissfully serving the lotus feet of Radha-Madhava in the loving mood of the gopis. Although one rarely attains this spiritual perfection, Lord Caitanya and His sincere followers are broadcasting this sublime message throughout the world. Srila Prabhupada was an intimate and empowered associate of Lord Caitanya. Therefore, to fulfil the Lord's inner desire. 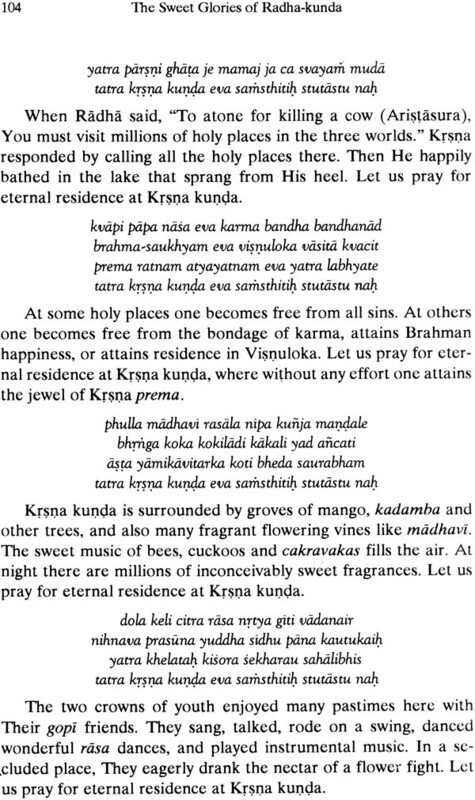 Srila Prabhunada translated Sri Rupa Gosvami's Sanskrit classic Sri Upadesamrta into English, calling it the Nectar oj Instruction. Nectar is a tonic that stimulates, energises, and extends one's life. This book is a nectar-tonic that stimulates prema to flow within the heart. The Nectar of Instruction leads one out of the body, and into the nectar of bathing in Srimati Radhika's eternal service in a divine body surcharged with spiritual ecstasy. Thinking that the nectar was only for a select audience, disciples became confused when Srila Prabhupada once ordered the BBT to print 100,000 copies of Sri Upadesamrta. One disciple said, "Srila Prabhupada, this book is not for the masses of people. Besides, since we only have about 10,000 devotees in our movement, it seems 10,000 copies would be sufficient." Srila Prabhupada replied, "You don't understand. This book is not just for our devotees. The Nectar of Instruction is for everyone! You should distribute it widely." 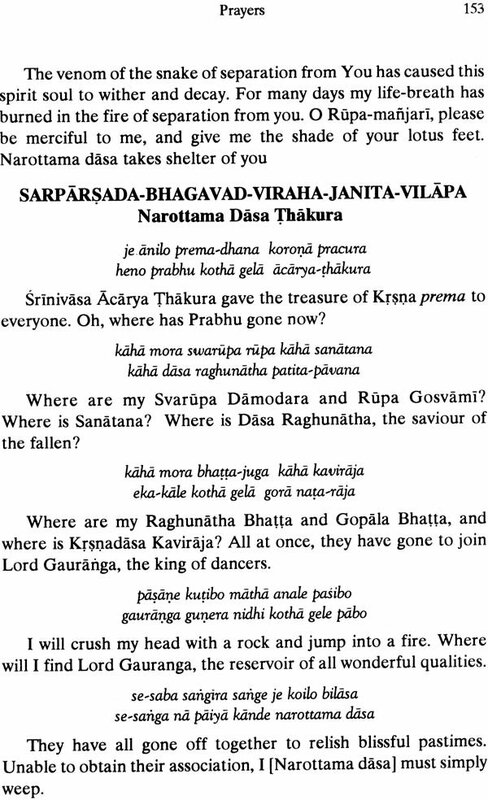 Since Srila Prabhupada's first English edition, Sri Upadesamrta has been translated into all the major languages. Millions of copies have been distributed around the world. Srila Prabhupada is fulfilling Lord Caitanya's desire to spread the glories of Radha-kunda to every town and village. Every year thousands of fortunate devotees visit Vrndavana, We thought a nectar-guidebook to Radha-kunda would help these devotees derive the greatest benefit from their pilgrimage. 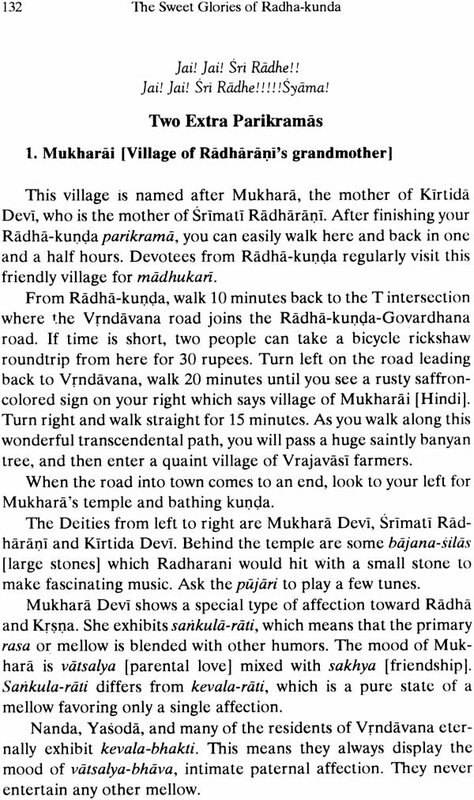 Besides describing all the holy places, Radha Kunda Mahima Madhuri is full of sastric quotations about the sweet glories of Radha- kunda. In one sense, the book is a golden treasure box full of precious gems and jewel-like slokas, shining with the beauty and sweetness of Srimati Radhika. Anywhere in the world, one can open this treasure box and swim in the nectar of remembering Radha-kunda. A fortunate soul can bring this treasure box to Vrndavana, open to the parikrama guide chapter, and wander through the nectar- filled groves of Radha-kunda. 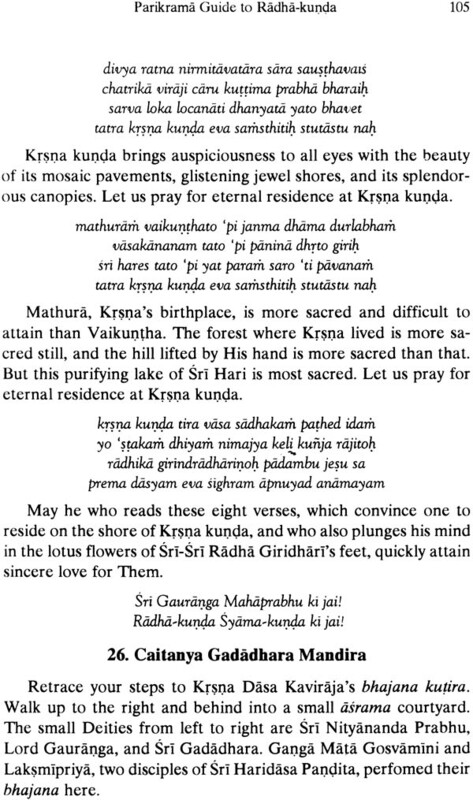 Then with a mind purified by the dust of parikrama, and a heart humbled by submissive prayers to the acaryas, one can bathe in the immortal nectar of Radha- kunda's prema-filled waters. We hope this book will serve the devotees as both a shower of nectar, and as a practical guidebook for visiting Sri Radha-kunda, the most sublime abode of Radha-Syamasundara. As Srila Prabhupada once said, "Radha-kunda is for relishing," similarly, we hope the devotees will also relish Radha Kunda Mahima Madhuri, the sweet glories of Radha-kunda.